Getting middle and high school students excited and involved in science isn’t always the easiest thing to do. But, for The University of New Mexico Department of Physics & Astronomy, being able to break out some big ‘toys’ is something that usually gets the job done. The department recently held its Lecture Demonstration Show on campus, an event that has taken place twice a year for the past two years. Students from across Albuquerque are invited to watch live physics demonstrations illustrating some fundamental principles of mechanics, optics, and electricity and magnetism. 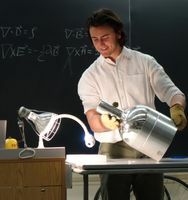 Physics major Nick Huntoon pours a small amount of liquid nitrogen out of a Dewar so as to cool a high-temperature superconductor through its transition temperature at -292 degrees Fahrenheit. Roughly 300 people, including a large number of elementary, middle and high school students, turned out for the latest demo show inside the Regener Hall Auditorium. Undergraduate and graduate students do nearly all of the demonstrations, using what they’re learning at UNM to teach others. 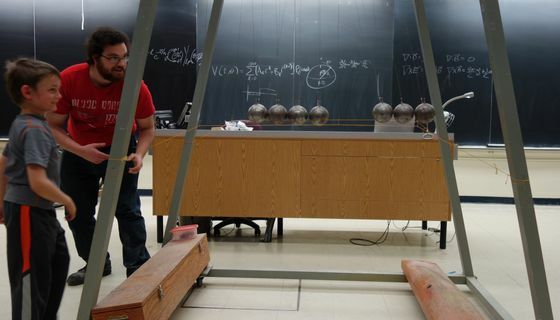 Students use a very large Newton’s Cradle to demonstrate the conservation of momentum and energy. There’s also an oversized pendulum and a Rubens’ Tube designed to show the the standing wave patterns for sound in a musical instrument. Attendees got to see an optical fiber demonstration, and learned more about the recent gravitational waves discovery. UNM graduate student Josh Martin, with help from a young audience member, illustrates conservation of momenturm and energy using a giant "Newton's Cradle." Dunlap said many of the larger demonstration pieces have been around since the 1960s, and credits past faculty for the opportunity to be able to have these kinds of events today. “Without their vision for the future, we probably wouldn’t have access to these huge pieces of equipment.” Dunlap said. Freshman physics major Lauren Zundel explains magnetism. Dunlap said UNM’s Physics & Astronomy department presented at School to World for years, but once the event went away, they wanted to find another way to connect with middle and high school students. Organizers are already planning another Demonstration Show for the fall. Make sure to check the Physics & Astronomy webpage this summer for more details.